The title bar is displayed at the top of the application screen. 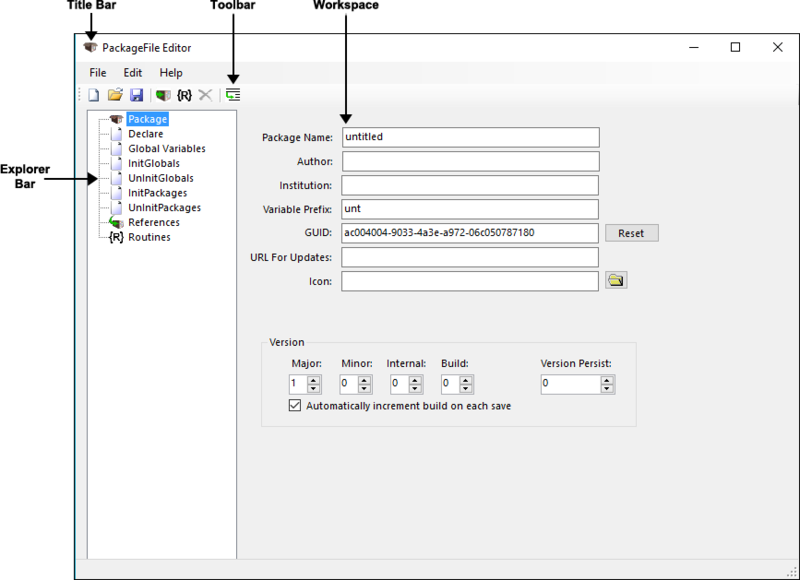 The title bar displays the PackageFile Editor icon, the name of the application (PackageFile Editor), and the name of the open file. The menu bar is displayed at the top of the application screen immediately below the title bar. The menu bar lists the menus available within the PackageFile Editor application, including the File, Edit, and Help menus. Below the menu bar, the toolbar displays the tool buttons associated with the PackageFile editor. On the left side of the application window, the Explorer window lists the components of the package file. The Workspace is located in the center of the application and is used to display the contents of the currently selected component.